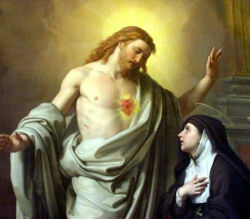 “O Sacred Heart of my Lord and Savior Jesus Christ, to Thee I consecrate and offer up my person and my life, my actions, trials and sufferings, that my entire being may henceforth only be employed in loving, honoring and glorifying Thee. This is my irrevocable will, to belong entirely to Thee, and to do all for Thy love, renouncing with my whole heart all that can displease Thee. “I take Thee, O Sacred Heart, for the sole object of my love, the protection of my life, the pledge of my salvation, the remedy of my frailty and inconstancy, the reparation for all the defects of my life, and my secure refuge at the hour of my death. Be Thou, O most merciful Heart, my justification before God Thy Father, and screen me from His anger which I have so justly merited. I fear all from my own weakness and malice, but placing my entire confidence in Thee, O Heart of Love, I hope for all from Thine infinite goodness. Annihilate in me all that can displease or resist Thee. Imprint Thy pure love so deeply in my heart that I may never forget Thee or be separated from Thee. I beseech Thee, through Thine infinite goodness, grant that my name be engraved on Thee, for in this I place all my happiness and all my glory, to live and to die as one of Thy devoted servants. Amen. This is what the Saint (St. Margaret Mary) wrote about the devotion: “One Friday, during holy Mass, I felt a great desire to honor the sufferings of my crucified Spouse. He told me lovingly that He desired me, every Friday, to adore Him thirty-three times upon the Cross, the throne of His mercy. I was to prostrate myself humbly at His feet, and try to remain there in the dispositions of the Blessed Virgin during His Passion. I was to offer these acts of adoration to the Eternal Father together with the sufferings of her Divine Son, to beg Him the conversion of all hardened and faithless hearts who resist the impulse of His grace. He told me, moreover, that at the hour of death He will be favorable to those who have been faithful to this practice. My God, I offer Thee Thy well-beloved Son, in thanksgiving for all the benefits I have received from Thee. I offer Him as my adoration, my petition, my oblation, and my resolutions; I offer Him as my love and my all. Receive, O Eternal Father, this offering for whatever Thou willest of me, since I have nothing to offer which is not unworthy of Thee, except Jesus, my Savior, Whom Thou hast given me with so much love. Amen. Heart of Jesus, saturated with revilings,Have mercy on us.